Web usage in New Zealand is a constantly changing landscape and keeping up with trends is important for all online businesses especially where user interaction is concerned. Figures released by TradeMe shows that around 60% of of Kiwi Internet users use two browsers: Chrome (38%) and Safari (21.9%), created by Google and Apple respectively. Internet Explorer is still used heavily though. For March 2015, the number of users visiting TradeMe with Internet Explorer was 26%, effectively putting Microsoft’s search engine in second place with 22.4% of those using IE9 or above and 21.8% using IE10 or above. 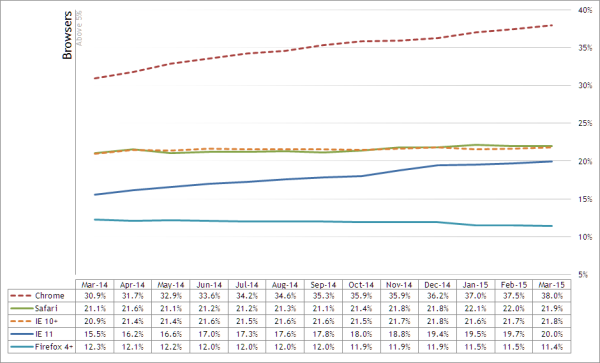 Mozilla’s Firefox trails with a still respectable 11.45% of users whilst the Opera browser barely registered. So around 97% of users are using the big four and over 93% (nearly 95% if you include the Android browser) are using browsers which can take advantage for more modern rendering CSS3 capabilities. You can see the full stats here. Why is browser usage at this online business relevant for Kiwi SME businesses? For many years, web design has been restricted by the continued usage of older browsers and their limitations and quirks. What many have been doing to get around this is to load additional files and create extra lines of code for cross-browser capability. Now that an overwhelming majority of users don’t require this, maybe it’s time to put an end to capability for legacy browsers and to speed up the internet experience. But TradeMe is only one website? True, but it is a good indicator and has a broad demographic of users and large number of monthly unique visitors. Perhaps it is time to reduce dollar spend on legacy browsers and instead, concentrate on updating that ageing website the way you always wanted to?